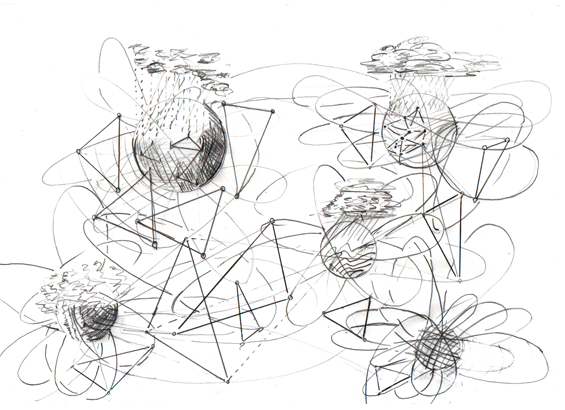 Point Line Flow: Spheres Blurs Triangles Clouds Assemblies. Sketches about the Present Future. This is a written piece that outlines the contours of the eponymous group show at Gallery Zvono, Belgrade, taking place from 13 to 26 June 2013. Lopte Obrisi Trouglovi Oblaci Skupovi. Skice o sadašnjoj budućnosti presents works by Nikola Kolja Božović, Snežana Vujović-Nikolić, Nikola Pešić, Simonida Rajčević, Vuk Ćuk and myself. Spheres¹ are simple but uncatchable to human eyes, which are their geometric kins, interfaces between the world, which is spheroid in its turn, and the head, which is an irregular sphere as well. Spheres are tangential, touching in passing, but not intersecting, thus by rulers they are reduced into plane where they appear to be communicating vessels. In this impossible narrative, a ball in a flat field seems to be waiting to be filled with energy from the outside, but it is always ready to burst, filled to the brim with compressed potentiality. While standing still, a ball can never be entirely be embraced by a gaze, vast portions slide beyond the horizon. That's why an onlooker has to run around the sphere or to make her run and turn around. Or a fleet of satellites is dispatched to perform elaborate spins striving to take apart and pull together the sphere into a flat image, which always remains a puzzling collage intersected by more or less elegant seams. What a swarm of hi-tech eyes cannot do, an embrace can, a ball or a globe can be held firmly in the arms, a feel of globality is at hand. But the rotation is paralysed, the roles are assigned. How does it feel not to be sure who circles around whom, who is a cat and who a mouse, who conceals and who reveals? Truths would orbit, in rhythm with the bodies they describe but not encircle. Blurs² are less than images and sketches of something more. In times of high resolution, bluriness is apparently superseded, a romantic vision of a landscape in haze, imprecisions that can be corrected by the tetris of bits and bytes fitted into the tabular matrix. But utopia of crisp clear resolution is not a universal right, not everything is for everyone's eyes. Clarities are transformed in opacities, as in Google's Street View wherein people's faces and car registration numbers are meticulously made indistinct. By twists of intents thought as errors, glitches or bugs, the trustworthy solid ones and zeros may leave blurs behind them, or blurs may even advance them. Spontaneously or mysteriously, on liquid crystal monitors or smartphone screens smudges of unclear origin spill over the calculated contours, on Skype human faces melt into otherworldly expressionist cubisms. Users/watchers struggle to reassemble what is the original task of algorithms and protocols to assemble. Blurs are inconstant witnesses to the silent unsmooth translations from one form(at) into another, from one state into another. After a screen refresh they might vanish, but their memory remains because it is deep inside and around us. We are still in the mist that knows no frames, the primordial plasma wherein reality and virtuality are at their most intimate . Triangle is critical because it whispers about potential resolution of the bipolarity. When a Third permeates the original coupling in a more or less convivial antagonism, such as that between the man and the nature, subject and object, mind and matter, the terrain swiftly becomes uncharted for the children of modernity. Beforehand, dualities were lined up in elegant war arrays orchestrated by dialectical tensions, now many other angles stretch out the lines in many other directions. Never before seen or never before looked at entities – hybrids, cyborgs, medleys of various categories - previously trusted or hoped to be safely outlined, are suddenly here around us. We are them. And all this amalgamous complexity blurring with chaos has its origins in the unsuspecting plain triangle. Nevertheless, triangles are not only cradles for monsters, humans would be lost in space if they were not carefully rocked between the three angles. Navigation becomes possible when the earth's surface is divided into grids of neighbouring triangles. A step in scale further, when via triangulation skies and earth are interlinked, no corner of the earth is in shadow. Triangle is a safe place to dwell in, than it leads nowhere. But, when stretched, it is where the crisis starts, a crisis which breaks the serried tracks and ranks, that leads elsewhere. Clouds bring mixed fortune, traditionally carriers of fertility, sometimes harbingers of hurricanes, at times their absence forebodes disasters. Today, when humans and their atmosphere have exceeded the imaginary boundary of 400 particles of CO2 per million, clouds are at the same time objects of desire, dreams and fears. Advanced meteorological bureaus specialise both in the artificial creation of clouds and in their preventive destruction. In parallel, on ground, less vaporous clouds, part soft part hard masses, are engineered to project into radiant futures. In scanty suburban warehouses, silicon, steel, gold, other rare and common alloys, compressed in circuits and towers of chips and strips, form weird anatomies whose interior murmurs are shrouded by the dull hum of coolers. Through alchemical acrobatics of codes and breath-taking infrastructural exhibitionisms, these skeletons transcend the force of gravity and extend to the skies. As of each genuine labyrinth, their ambition stretches from (below) ground towards the celestial spheres. Hertzian clouds cover the cities, projecting not shadows but enlightening information, a drip here and a drip there in low bandwidths and thunderstorms driven by mobile G forces. Skies have never been closer, but it is not exactly the smooth continuous vault of heaven. It is portioned in discreet patches of uneven clouds, with as many fringes and holes. Give on demand, harness by demand. “Everything melts into the air”? or everything condensates into selective showers of data? One thing is for sure, the rain is now more important than architecture, the ubiquitous and incessant loops of rain and evaporation, almost as quick as sun rays, demanding new tactics for how to get soaked or stay dry. Assemblies³ of things, of other-than-humans, of humans. Network carries potential for assembling, but many highways and gateways have to be traversed so to gather and meet scattered threads, statuses and tweets, so to create nodes of intents which together count more than what statistics detects and counts. Assemblies are thus not slick sums of clicks and clips, instead are under surface whirlpools of infra-actions, they are events, but for them to take place a “matter of (common) concern” needs to work as a spinner for gathering and interlacing. Where tiny or massive multiplicities of things-that-gather emit and reflect hallos and echoes, “the internet of things” is being woven, a landscape through which objects, animals, and other entities tend one(s) toward the other(s) via wire bands of causes and effects, of local (lineal) and/or global (spherical) origin and reach. In their nature, these assemblies cannot be exclusive or enclosed, their contours are blurred and cloudy. They are made of entities connected and divided via triangular yarnings of concerns, ever bustling through shifting states of aggregation. Assemblies do not aspire towards shining impeccable crystals, they strive towards surprising and strange jumbles of transparent understandings and opaque misunderstandings, of transparent incomprehensions and opaque comprehensions, which is the sublime stuff the floating everyday of their togetherness is made of. 1) spheres or balls or globes. 2) hazy outlines or contours. 3) assemblages (Latour), mathematical sets or wholes or gatherings.